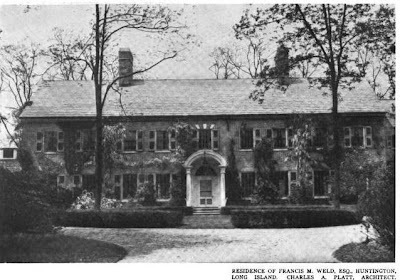 'Lulworth', the Francis M. Weld Jr. estate designed by Charles Platt between 1912-14 in Lloyd Harbor. 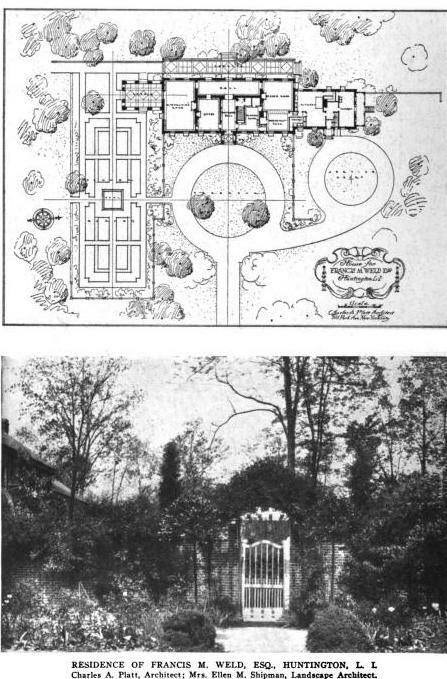 The estate also had Olmsted landscaping and Ellen Shipman (along with Charles Platt) designed the walled flower garden and brick terrace. Weld was an industrialist and financier whose second marriage was to one of Louis C. Tiffany's twin daughters. Weld was killed in an airplane crash in 1949. 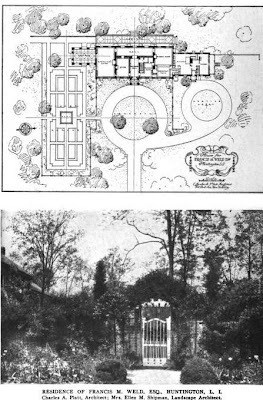 The estate's property has since been subdivided but click HERE to see the house on google earth. any relation to Mass. Governor Weld? I believe he comes from old L.I. money. I spent lots of overnights and birthday parties there as a child. My sister and I were friends and schoolmates with Robin and Charlie Platt back in the 1960s! Spent lots of time here as a child with my old friends Robin & Charlie Platt in the 1960s!